In August, the RHIVA Regional Programme held a workshop at the Blue Waters Hotel for the newly appointed in-country staff. 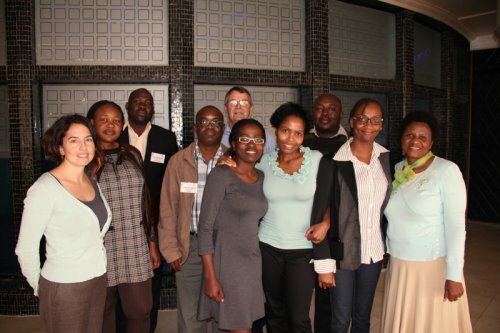 RHIVA Regional employs an in-country coordinator and a trainer in each of the three “RHIVA Member States” – Mozambique, Namibia and Zambia – and the purpose of the workshop was to orientate and train them ahead of implementation. The workshop addressed administrative, human resources, planning and reporting matters, in order to help the in-country staff understand MIET AFRICA’s procedures regarding project implementation and management in SADC countries. However, perhaps the most critical part of the workshop was introducing the new staff to both the RHIVA Regional Programme itself, and its alignment to CSTL. Delegates were also given a chance to engage with RHIVA materials, and to see how they will be used in different country settings and contexts. At the same time, they were asked to determine whether any adaptations and changes would be needed to make them more country specific. Participants also engaged with the issues such as school-based support structures and the development of in-country implementation plans. Some senior members of staff from MIET AFRICA also attended a session on the RHIVA baseline study, at which the consultant, IOAS, introduced the concept of Social Return on Investment (SROI). SROI analysis measures the social, environmental, and economic costs and benefits of an intervention, and will be incorporated into the RHIVA Regional baseline study. The workshop closed with a gala dinner at which the in-country staff were formally welcomed to the MIET AFRICA team by then CEO, Thobile Sifunda.